I picked up the new issue of Blue & Gray Magazine the other day. I’m not sure why I haven’t subscribed yet. It’s really a very good magazine and I always seem to enjoy it. 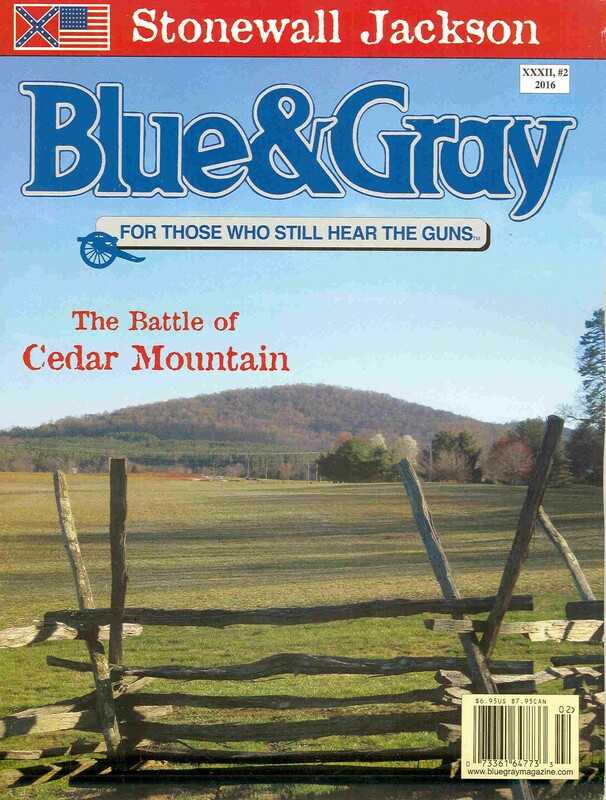 This issue covers the Battle of Cedar Mountain. There is an article written by Michael E. Block, the Vice President of the Friends of Cedar Mountain Battlefield. As always, the issue is loaded with maps. There are NINE battle maps in addition to several others that are relevant to the article. Also included is an excellent 11 stop driving tour titled; The Culmination of a Legend Building Spring and A Failing Campaign on the Peninsula authored by Dave Roth with Bike Block. The tour and article are full of historic and modern photos. Also included is a collection of book reviews. Well worth looking for or subscribing. The September 2016 issue of America’s Civil War arrived in the mailbox this week. Blood Brothers written by John Hoptak. Discuses the Pennsylvania Reserves during the Maryland Campaign. Best Belt Revolver I Have Yet Seen written by Michael G. Williams. Discusses self contained metallic ammunition by Smith & Wesson. Carolina Maulin written by Christine M. Kreiser. Ambrose Burnside launches the war’s first major amphibious operation. Forgotten Captive written by Lawrence Lee Hewitt. Florida’s Theodore W> Brevard never learned he had been promoted to Brigadier General. All in the Cards written by Tim Rowland. NPS trading cards. Graham, Michael B. On This Day in West Virginia Civil War History. Charleston: Arcadia Publishing. 2015. Bibliography, b/w photos. 191 pages. ISBN 9781467117913, $21.99. Having broken away from Virginia in 1862 and being admitted to the Union in June 1863, West Virginia despite being small in size and population was still an important border state especially with an uncertain election happening the following year. In his new book Dr. Michael B. Graham takes a day by day look at the war through the eyes, ears and terrain of the Mountaineer State. I should clarify that this is not an attempt to tell the story of the war in West Virginia. Rather, for each day a fact is provided relative to the war and the state. If you were to scan through and take a sampling of years you would find that all years are covered. The length and depth of entries varies from just a sentence to at most half a page. This brevity is both a blessing and a curse. The book can be digested in short snippets. If you only have a few minutes you can read through a day or twos events with little problem and not feel bad about putting it down. Because of this brevity however this is little flow and so it becomes easy to put it down and not pick it up for a few days. The book is interesting and the writing is fine. The research appears to be quite solid (more on that in a minute). Because there is no continuity or background I often found myself confused. I am not familiar with West Virginia geography so a map would have been a tremendous help. Also, from day-to-day, readers will find themselves going from one campaign or battle to another, from a regiment activity to a brigade level action on the other side of the state. Perhaps if I was more familiar with West Virginia history and geography it would make more sense. As mentioned, there is no map, so finding where events took place requires an outside source. That said, having worked with them I know Arcadia has firm space limitations and the cost of developing a map would fall to the author. The book contains more than fifty photos, the majority of which are from the Library of Congress. There are no footnotes, again, most likely a concession to space. The bibliography however is over ten pages long and features many primary sources along with more current scholarship. It’s obvious Dr. Graham did his homework. This is a book that I can certainly see being very popular in the state. It takes events relevant to home and puts them in an easy to read and digest fashion. I know that living in Florida I enjoy the Florida version. 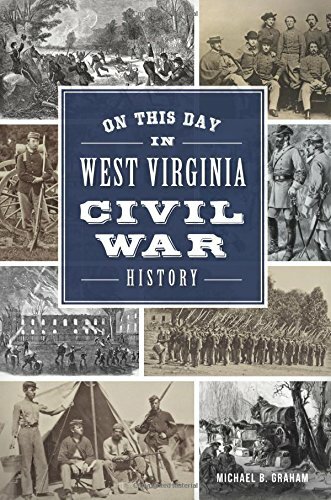 Recommended for those living in the geographic area or for those just looking for a brief introduction to the war efforts in West Virginia.